An infection with the dangerous CRAB Scarab virus leads to serious security issues. Victims can restore and protect their computers by following our complete removal guide. CRAB Scarab virus is a new data locker ransomware that has been released in attack campaigns against computer users worldwide. The threat could be utilizing widely used tactics of distribution to infect computer systems. One of the easiest ways for the criminals to spread the payload of CRAB Scarab ransomware is by attaching it to email messages that are later released in active attack campaigns. The method allows hackers to send the virus to large lists of potential victims. The attachments to malicious email spam messages usually have Word documents or other types of files which users open without hesitation. Once opened on a target host these compromised files trigger the ransomware payload and infect the device with CRAB Scarab crypto virus. Other infection tactic related to emails is hyperlink inserted in the content of the messages. The links are usually labeled as leading to a familiar website or a file of user interest. 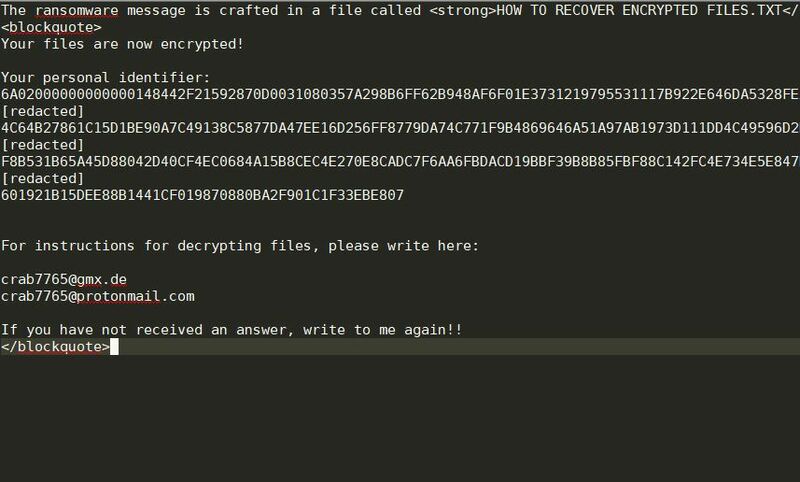 Computer criminals behind this new ransomware can be using malicious sites or download portals to distribute malware of different kinds, including CRAB Scarab virus. A popular option is the use of infected documents which may be of different types ‒ spreadsheets, rich text documents, presentations and databases. They are modified to initiate the virus once the built-in scripts are run. Usually when the files are opened a notification will ask the users to run the macros (scripts). If this is done the infection follows. The hacker-controlled sites are specialist portals that have been created either manually or automatically by the criminals behind CRAB Scarab virus. They can either directly distribute the threat by initiating various scripts or automated operations or link to such instances. Redirects are usually caused by email interaction, ad networks or other browsing activity. However one of the main sources is the availability of browser hijackers. They are malicious add-ons made for the most popular web browsers ‒ Mozilla Firefox, Google Chrome, Internet Explorer, Opera, Microsoft Edge and Safari. Once installed they not only infect the users with the malware, but also redirect the victims to a hacker-controlled site. Depending on the configuration the browser hijackers can also steal sensitive information such as any stored passwords, account credentials, history, bookmarks, form data and settings. The Crab Scarab strain is the latest release of the Scarab ransomware family which was recently announced in an ongoing attack. According to the available reports this is an updated version of the Scarab-Bin variant which hit computer targets back in July 2018. The CRAB Scarab ransomware may follow the same behavior patterns as the previous releases. This means that it is likely that the infiltrations will begin by launching the data collection module. It will scan the local system for strings that are used to construct the unique victim ID — a report on the installed hardware components, operating system characteristics and user settings. In addition this component can also expose the identity of the victims by searching for strings that can expose them. Example ones are their name, address, phone number, interests, location and any stored accounts. One of the dangers of this type of information collection is the fact that the CRAB Scarab engine may access both the operating system and the installed user applications, including web browsers. When this step is complete the ransomware will continue by initiating a stealth protection module. This is one of the most important steps as it will protect the virus instance from discovery and security software that can interfere with its correct execution. The typical detection is done by applying signature scans looking out for applications such as anti-virus programs, debug environments and virtual machine hosts. Their real-time engines can be bypassed or altogether removed. When this is done the CRAB Scarab virus will have total control of the system. Whenever this step is achieved the Windows Registry will be modified. The virus engine will change values belonging both to the operating system and the user-installed applications. When the Windows strings are affected important services will be disabled and the users may experience serious performance issues. Modified values belonging to the installed applications will result in the inability to launch certain functions. A related mechanism that is triggered is the stealth protection module which will launch the virus module every time the computer is powered on. It may also block the ability to enter into the recovery boot menu and block other apps from launching it. To cause further damage to the infected hosts it can be programmed to sensitive user data such as the System Restore Points, Backups and Shadow Volume Copies. This can make it more difficult to restore the compromised systems. In addition infections with viruses like the CRAB Scarab ransomware can lead to the installation of other threats. In the case of Trojans this can enable the malicious operators to take over control of the systems by setting up a secure and persistent connection to a hacker-controlled server. It will allow the hackers to spy on the users at any given time, take over their computers and hijack all stored information both before and after the ransomware engine is called . As a result all victim files will be renamed with the .crab extension. According to the collected samples before the .crab extension is applied the hacker’s email address will be applied. Please note that paying the requested ransom fee to cyber criminals does not really solve your problem with CRAB Scarab crypto virus. In fact, you only encourage hackers to continue spreading ransomware of this kind. Instead, you must remove the threat immediately, and only then look for optional ways to recover your data. WARNING! Manual removal of CRAB Scarab ransomware virus requires being familiar with system files and registries. Removing important data accidentally can lead to permanent system damage. If you don’t feel comfortable with manual instructions, download a powerful anti-malware tool that will scan your system for malware and clean it safely for you. WARNING! All files and objects associated with CRAB Scarab ransomware virus should be removed from the infected PC before any data recovery attempts. Otherwise the virus may encrypt restored files. Furthermore, a backup of all encrypted files stored on external media is highly recommendable.